On November 1, 2011, President Barack H. Obama appointed Larry L. Palmer the United States Ambassador to Barbados and the Eastern Caribbean. On March 30, 2012, the U.S. Senate confirmed Palmer’s nomination and he reported to his post in Bridgetown, Barbados. Born in Augusta, Georgia, on July 13, 1949, Palmer was also the U.S. Ambassador to Honduras under President George W. Bush (2002-2005). Between his two ambassadorships, Palmer also headed the Inter-American Foundation (2005-2010), a U.S. government agency which allocates financial aid throughout Latin America. Palmer was valedictorian of the class of 1966 at T.W. Josey High School in Augusta, Georgia. He later attended Emory University in Atlanta, Georgia, on scholarship. In 1970, he received his Bachelor of Arts in history from Emory. The following year he joined the Peace Corps, volunteering to serve as a teacher in Liberia (1971-1973). In 1973 Palmer obtained his Master of Education degree with an emphasis in African history from Texas Southern University. He then worked as assistant director of financial aid at the University of Virginia (1973-1974) and was a professor of history at Cuttington College in Suakoko, Liberia (1974-1976). In 1978 Palmer received a Doctorate of Education degree with a concentration in Higher Education and African Studies from Indiana University in Bloomington, Indiana. For the next three years he taught history at Wake Forest University in Winston-Salem, North Carolina. In 1982, Palmer left academia to work for the United States Foreign Service. His first overseas assignment was as vice consul in the Dominican Republic (1982-1984). He then worked as a personnel officer in U.S. Embassies in Montevideo, Uruguay, and Asuncion, Paraguay (1984-1986). Returning to the U.S. in 1986 he became a staff assistant to the Assistant Secretary of State for African Affairs (1986-1987). In 1987 Palmer was assigned to the U.S. Embassy in Freetown, Sierra Leone. Beginning in 1989 Palmer took a leave from the Foreign Service to become the Pearson Fellow where he served as assistant to University of Texas, El Paso President Diana Natalicio. While there he helped implement faculty and student exchange programs with Mexico and the rest of Latin America and served as a consultant for International Affairs. 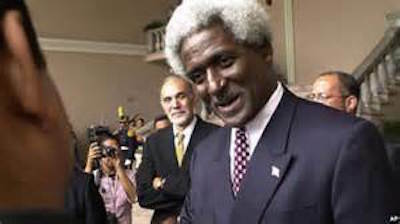 Palmer returned to the Foreign Service and was assigned to the U.S. Embassies in Seoul, Korea (1991-1994) and the Dominican Republic once more (1994-1998). He served as Deputy Chief of Mission at the U.S. Embassy in Quito, Ecuador (1999-2002). He then was appointed U.S. Ambassador to Honduras from 2002 to 2005. On June 28, 2010 President Obama nominated Palmer as the next United States Ambassador to Venezuela. On September 19, however, Venezuelan President Hugo Chavez announced that he would not allow Palmer to take his post. President Chavez accused Palmer of making critical remarks about his government including accusing members of the Chavez government of having ties to leftist Colombian rebels. After three months of U.S. insistence that Palmer be installed as ambassador, Chavez continued his opposition prompting the Obama Administration to expel Venezuela’s Ambassador, Bernardo Alvarez Herrera. In 2012, Palmer began serving as U.S. Ambassador to Barbados and the Eastern Caribbean which includes the small island nations of Antigua and Barbuda, Dominica, Grenada, St. Kitts and Nevis, St. Lucia, and St. Vincent and the Grenadines. Palmer continues to hold his post to this day. Ambassador Larry Palmer and his wife, Lucille, have one child. “Former UTEP Staff Member Named U.S. Ambassador to Venezuela,” The University of Texas El Paso, http://admin.utep.edu/Default.aspx?tabid=65892; “President Obama Announces More Key Administration Posts, 6/28/10,” The White House, http://www.whitehouse.gov/the-press-office/president-obama-announces-more-key-administration-posts-62810;“Ambassador to Barbados and the Eastern Caribbean: Who Is Larry Leon Palmer?,” ALLGOV, http://www.allgov.com/news/appointments-and-resignations/ambassador-to-barbados-and-the-eastern-caribbean-who-is-larry-leon-palmer?news=843889.